Paul Birken is in the house! 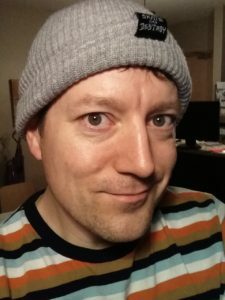 Dustin drops by Paul’s studio to catch up with this fellow-Minneapolis producer and local hero in the latest episode of Train Wrecks. Paul started releasing his first records twenty years ago debuting with the classic “Surfin’ Superior” release on Communique. Since then Paul has more than 40 releases under his name which span various genres, including some with a variety of collaborators. He’s also known for his infamous all-gear live sets that have taken him all over the United States and Europe. The “Tindy” grab. A whole lotta “NOPE” here. More recently, Paul has injected his tough and quirky sound into the new generation of techno fans by traveling to Europe in support of recent releases on labels like MORD and Ear Wiggle. In 2013, he released a collaborative track with Mike Parker on the Brothers label. Paul has other hobbies too! Aside from being a family man, he likes to draw silly pictures and skateboard with his kids. 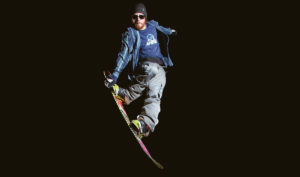 He’s also an avid snowboarder since the 1980s. We cover these topics and more! 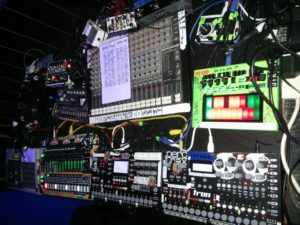 One of Paul’s live set rigs. London 2014. Click here to check out the Moodyman set that Dustin discusses in the beginning of the podcast!